Price Range £249 - £1980Price RangeSimply drag the slider bar to set your price range. When racing legend Geoff Duke had his tailor whip up an all-in-one leather suit for the 1950 Isle of Man TT he led the way for every racer and serious road rider. 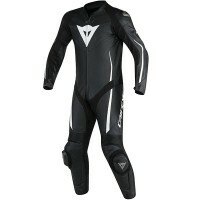 Today's suits have a wealth of features to boost protection and comfort. 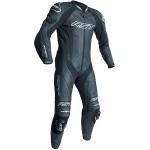 Our wide range features suits made from tough cowhide or lightweight kangaroo skin and we stock every manufacturer worth mentioning. We deliver for free and if you're not completely satisfied, we offer free returns for up to 365 days so you can be sure you'll land the right suit for you. I bought this after struggling to find a suit that would fit a curvier woman. Fits like an absolute glove, true to size. The leather is very soft and it looks great. Very fast delivery. I usually wear a size 8/10 top and a size 12 below. I bought a size 12 and it fit very tight but very well. 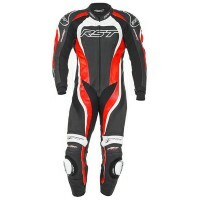 The RST suit has already been tested and it exceeds my expectations. Beware whoever thinks standing or walking will test the suit, no chance. It feels horrible doing either. 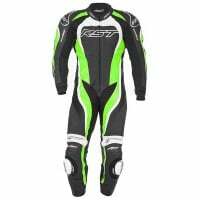 When it comes to sitting on your bike and riding it, this is the only way to tell and the suit is remarkably comfy and feels good to wear actually. No uncomfortable bits sticking into you in unwanted places like some suits I've tried. For the money this suit is fantastic. Great value. 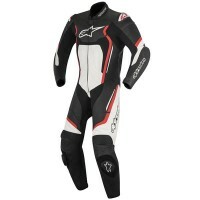 You just cant fault sports bike shop. From prices, to service and delivery they are impossible to beat. It's a bikers dream to shop here. 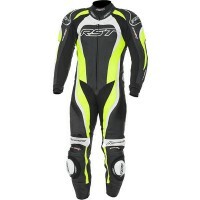 I bought these because my mate had an off at cadwell, last year. And they held up extremely well, a little scuffing but all stitching and seams were perfectly intact because of the triple stitching, he wore the back protector too. My own personal experience so far, is basically breaking them in. 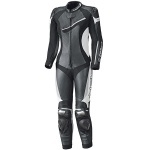 They are a very tight fit when standing and the precurved style pulls you down slightly into a hunch but the neck stretch panel means there's no pressure on the back of your neck, the stretch panels on the legs and crotch make movement on the bike a breeze, and the suit even brand new feels comfortable when riding. My mate says that once he had broken his in, it became easy to walk normally in (I've not reached that stage yet). 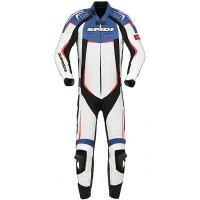 The whole suit is very high quality considering the price and looks great to boot. All the branding is painted on instead of embroidered but it's done to a high quality. There's a video of a guy being pulled behind a car on YouTube testing them, it's only a short video but it gives you an idea of how well they fair in an off. 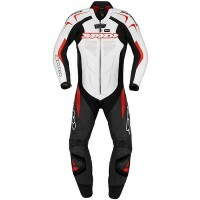 Myself and my mate highly recommend these leathers because for the money there's no better protection. Just remember to break em in before fitting a back protector especially if you buy the proper size for you meaning the leathers are skin tight/like a second skin. 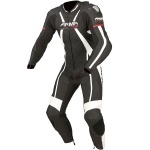 Really impressed with these just a heads up the pic used on this site is a generic one in the pic it shows the leathers with ally shoulder plates and no red elbow sliders and minimal branding this must be a pic of an older version as the ones you get will have, all branding, red elbow sliders and ally elbow slider just behind that but the shoulder section is just leather, no ally slider there. 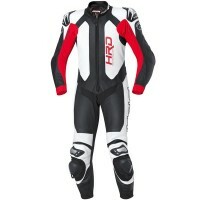 But the ones with the red elbow sliders etc, looks way better anyway imo and we're the ones I originally wanted anyway but because of the pic and the 20% off thought I was getting the other style, was glad when it was the latter that came.